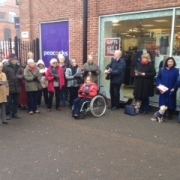 Church leaders across Merseyside and beyond are backing a faith led campaign to put the protection of services to the vulnerable at the heart of the election campaign. The Hope Charter, a document that affirms social care as a basic human right and calls for the protection of services to the vulnerable. More information is available on the Diocese of Liverpool web site. Ahead of the general election, the Church of England’s most senior clergymen: the Most Reverend Justin Welby, the Archbishop of Canterbury, and the Most Reverend John Sentamu, the Archbishop of York have written a pastoral letter to parishes and chaplaincies. The archbishops call for a “just economy”; one not over-reliant on debt that “risks crushing those who take on too much”. View this year’s video Easter message from Bishop Paul to all in the Diocese of Liverpool. We are holding a brunch to raise monies for our Africa fund on Saturday 1st April from 10:30 to 1pm in the church hall. Delicious soups, sandwiches and homemade cakes will be on offer. There will also be a number of stalls including a tombola and raffle. Please come along and help support this life saving work. 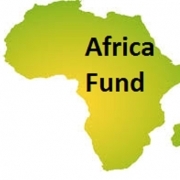 More information on the fund is available on our Africa fund pages. 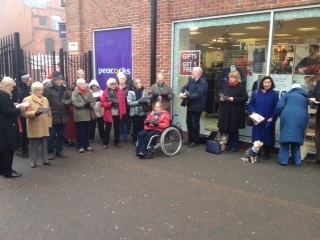 A group of Carol singers from St Thomas’, St Luke’s and other churches were in good voice this morning at the Gerard Centre. I recommend watching this great video which reminds us of the real meaning of Christmas. If you are able to, please fill a shoe box with useful and fun items for a child in desperate poverty this year. Ready decorated shoe boxes are available to buy again this year (40p each from Cheryl). 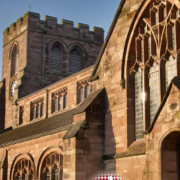 Leaflets containing all of the necessary information are on the table at the back of church. Filled shoe boxes should be brought to St Thomas’ or St Luke’s on Sunday 6th November please. 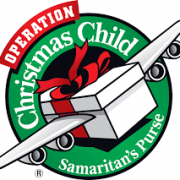 More information is available on the Samaritan’s purse web site. As the world talks about Halloween we have a different way to engage with the themes of death with this excellent video produced by Andy Dykes of Liverpool Cathedral. 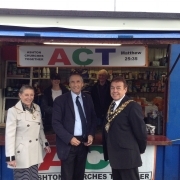 The Mayor and Mayoress of Wigan Ron and Janet Conway recently came to help the ACT food bank celebrate 4 years of existence. The Mayor praised the work of the churches and people in the community who are helping to meet the needs of those in crisis.